Vista Host Inc. | About Us - Vista Host Inc.
Vista Host is a hotel management company with industry-leading expertise in managing limited feature hotels, mid-scale full-service hotels, convention hotels, and resorts. Over the past 40 years, we have managed a wide array of franchise brands including Hampton Inn, Hampton Inn & Suites, Hilton Garden Inn, Homewood Suites, Home2 Suites by Hilton, Residence Inn by Marriott, Courtyard by Marriott, Fairfield Inn & Suites by Marriott, Towneplace Suites by Marriott, Hawthorn Suites, Holiday Inn, Holiday Inn Express, Sunspree Resorts, Amerisuites, and Comfort Inn. We know that each hotel is unique and that we must address the specific needs of each hotel to maximize returns for our owners. Vista Host’s operational strength flows from our focus in five primary areas: a strong commitment to providing legendary service to our Guests; engaged involvement from our General Managers in our revenue management and sales efforts; a comprehensive sales training program; optimum efficiency in labor and operating costs; and, a keen focus on talent development through award-winning programs such as our MIT (Manager In Training) program to ensure that we are constantly positioned to entertain new projects. Vista Host is exclusively devoted to the hospitality industry. We built the 9th Hampton in the system in 1986 and have continued to serve for 25 years on the Hampton Advisory Council. In 1991, we were engaged to manage a chain of 17 hotels (Dillon Inns) in the Midwest. We converted them to national franchises including ten to Hampton Inn and were named Hotel Developer of the Year by Promus. After doubling in value, they were sold to RFS, the first hotel REIT, and these hotels gave credibility to this REIT at the time. We built one of the first Hampton Inn/Homewood Suites hotel combinations in 1996. In 2008, we sold 7 hotels that we developed and built to Apple REIT for $112M. This was $153K per key. We continue to manage the hotels for Apple. Marriott named our Courtyard in Fayetteville, AR as the number one Courtyard out of 802 in 2009. 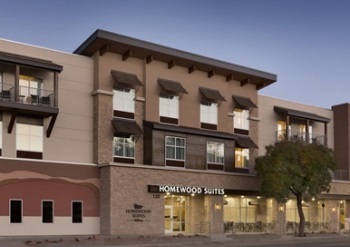 We opened the 300th Homewood Suites in September 2010. When comparing our financial results with others in groups such as the Multiple Franchise Owners Group and Apple REIT’s hotels, our hotels consistently lead our peers in terms of profitability. We have built and developed 30 new hotels and now have 13 in various stages of development.